Born in Queensland, Andrew Dutney moved to Scotland to Study and work. Here he was a postgraduate student at the University of St Andrews and the assistant minister in a Church of Scotland parish in Leven, Fife where he was ordained. Later, Andrew moved to Sydney where he was the Uniting Church’s chaplain to Sydney University and the minister of the Wesley College Chapel Parish. 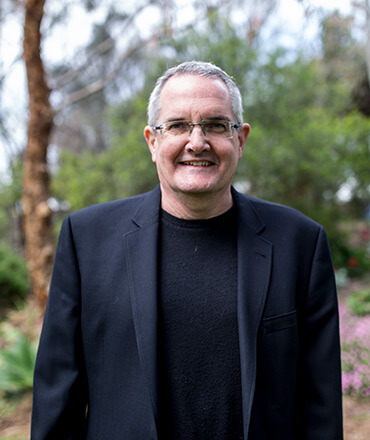 After moving to Adelaide to take up an appointment as lecturer in systematic theology at Parkin-Wesley College, he was then appointed as Principal in 2001. Andrew Dutney was the founding Director of the Centre for Theology, Science and Culture from 1999 until 2005. He was the chairperson of the SA Council on Reproductive Technology from 1996 until 2005. He is a member of the Advisory Board of the Ethics Centre of South Australia, a guest on ABC Local Radio and writes a regular column in Australian Leadership, focussing on questions of public and practical theology that emerge through his involvement with the wider South Australian community. In July 2009 Andrew was chosen to be the next President of the national Assembly of the Uniting Church in Australia. He was installed in that position in July 2012 and served full-time for three years. In 2016, Andrew has now returned to the role of Principal, Uniting College for Leadership & Theology.